The unique dwelling arrangements can help neighbors connect to form a community. As rent continues to soar in the Emerald City, small dorm-like apartments with shared common spaces are beginning to flourish. They’re often in convenient urban locations, observes Svenja Gudell, chief economist for Zillow. And being near city amenities—coffeehouses, parks, restaurants, public transportation—can make living in a small space more palatable. These small efficiency dwelling units (SEDU) average about $950 per month, says Gudell. That’s not cheap, but less expensive than the average rent for a studio apartment in Seattle, which is just under $1,500 a month. Many SEDUs include resident-friendly features, such as bike parking, high-speed internet and sound-insulated floors and walls, as seen at Footprint Greenwood (Greenwood, 143 NW 85th St.; 206.323.1771). Such units also frequently have common spaces—from rooftop decks and grilling areas to fully equipped shared kitchens—that can foster a built-in community, much as college dorms do. Shared spaces are also a hallmark of cohousing communities. These intentionally planned neighborhoods include private homes with jointly owned, communal spaces. Members commit to sharing space—and, to some degree, sharing their lives. 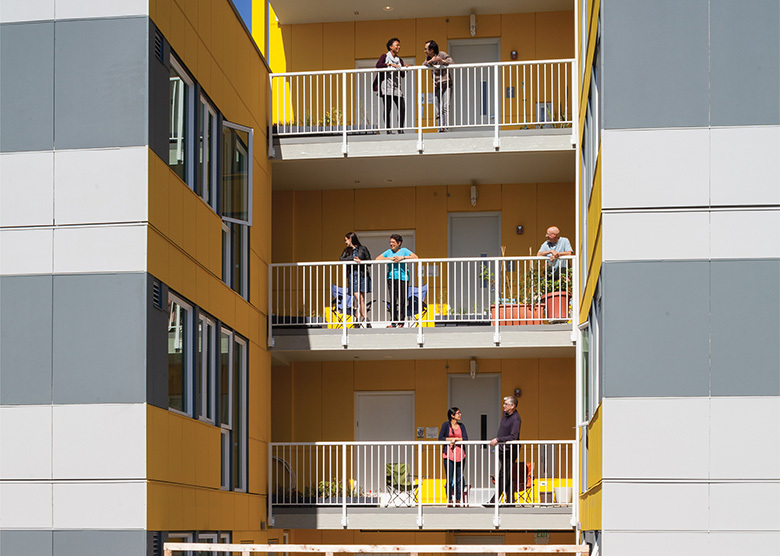 But while most cohousing communities are composed of traditional single-family homes located in suburban towns, Capitol Hill Urban Cohousing (Capitol Hill, 1720 12th Ave.; 206.285.1589), completed in June 2016, is a multistory, multi-unit building in a highly urban setting. “There’s a lot of people thinking how we can live in a better urban environment,” says Grace Kim, a member of the community who is also an architect and co-owner (with her husband) of Schemata Workshop, which was instrumental in building the cohousing project. Photograph by Footprint Investments. Footprint Greenwood offers a sitting area where neighbors can chat while doing laundry. Residents of Capitol Hill Urban Cohousing (whose ages range from less than a year to over 60) thrive in their supportive community. They work in teams to cook dinner for fellow members, and mentor each other in different ways. City regulations—effective since June 2016—have minimum standards for SEDUs: They must be at least 220-square-feet and include a kitchenette, storage space of at least 55-cubic-feet, natural light and a bathroom.